Rev. 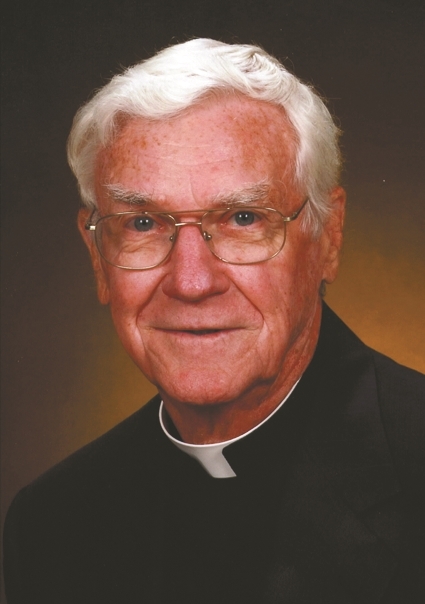 John F. Hynes, 89, a resident of Bettendorf, Iowa, and a priest of the Diocese of Davenport, died Wednesday, April 4, 2018 at Genesis Medical Center in Davenport. John Hynes was one of the “Founding Fathers” of the AUSCP. Details of his death and funeral came from Father Bob McAleer, and also from Halligan McCabe DeVries Funeral Home. “John F. Hynes, one of the original 27 died on Wednesday, April 4 in Davenport . . . . I hope all know that John was my closest friend . . . . We were golfing buddies for many years. “John volunteered to assist me [at St. John Vianney] for 13 years, all that after his retirement. Of course, the past years he was not able to attend AUSCP gatherings but was always inquisitive about the workings of AUSCP. “John had a vibrant mind studying scriptures, theology and many subjects to his later years. The past years I have cared in many ways for him -- doctor visits, travel, his participation in so many activities and my usual Sunday night dinner guest. We retired from Vianney together. In 13 years, as priests working together we never had disagreements. Funeral services and a Mass of Christian Burial will be 11:00 a.m. on Wednesday, April 11, 2018 at St. John Vianney Catholic Church, 4095 – 18th Street, Bettendorf. Burial will be in Mt. Calvary Cemetery, Davenport. Visitation is 3:00 to 7:00 p.m. Tuesday, April 10 at St. John Vianney with a prayer service at 7:00. Memorials may be made Priests Aid Society, Congregation to the Humility of Mary, or a parish of your choice. John Francis Hynes was born September 26, 1928 in Davenport the son of John F. and Ellen A. (Browne) Hynes. John was educated in Davenport attending Sacred Heart School, St. Ambrose Academy, and St. Ambrose College receiving his BA degree in Philosphy in 1951. He attended St. Mary’s Seminary in Baltimore, Maryland receiving his STB degree in Theology in 1953. John Hynes was ordained a priest in the Diocese of Davenport at Sacred Heart Cathedral, Davenport on June 4, 1955 by Bishop Ralph Hayes. Fr. Hynes was assistant pastor at St. Mary of the Visitation in Ottumwa (1955-65), St. Boniface’s, Clinton (1965-67), and St. Joseph’s, DeWitt (1967-70). He served as pastor at St. Joseph’s, Davenport (1970-83), St. Ann’s, Long Grove (1983-91), St. Paul the Apostle, Davenport (1991-94), and Our Lady of the River, LeClaire (1994-1998). He was a member of the Diocesan Ecumenical Commission from 1970-84, and the Priests’ Senate from 1977-80 serving two terms as president. Fr. Hynes retired July 7, 1998. He had also assisted at St. John Vianney, Bettendorf for thirteen years. He is survived by his sisters; Mary Beckman, Margaret Koehler and Bette Stevenson; numerous loving nieces, nephews and friends.